Today, we went to watch the Candy Man in Kawagoe. Mr Suzuki is a performance artist, who sculpts candy into different shapes, characters and forms. It is an art form from the Edo period known as Amezaiku in Japan. From what I have seen of his work, his repertoire apparently knows no limits. Anpanman candy wrapped and ready to eat! The Candy Man Suzuki, one of only a few traditional candy folk artists practising regularly in Japan, performs in the Sweet Street (or Penny Candy Alley) of Kawagoe（川越菓子屋横町）。 Kawagoe is referred to as Little Edo and this candy craft dates back to the Edo period. Suzuki uses a taffy like mixture, similar to corn syrup, which is made from rice and malt. 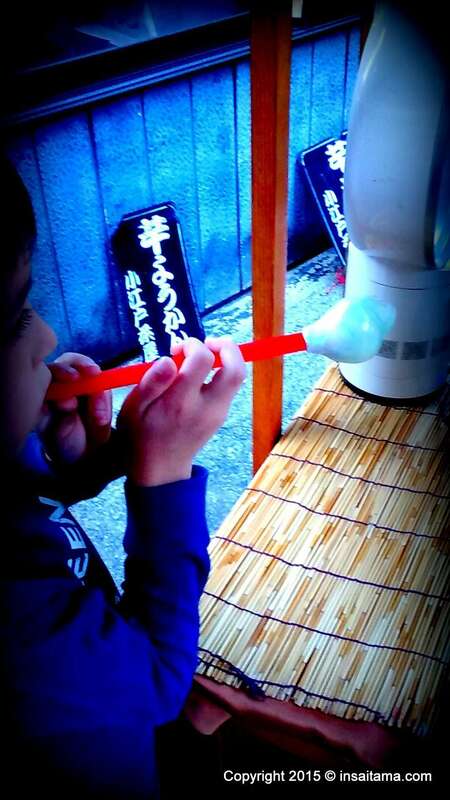 It is called Mizuame in Japanese, which translates to “water candy”. Suzuki shapes the candy, while it is still hot, into different cartoon characters, animals and objects. It costs only 300 yen for one of his completed sculpted candy. One of the appeals of this type of candy street stall, is that you can make your own blowing candy for just 100 yen (less than one Euro). Suzuki prepares the hot glutinous starch syrup placing it on a straw. You blow into it to give it a ball like shape. If you fail to blow into shape before it hardens, he will fix it into a ame no tori, candy bird, for you, by snipping and shaping. This could be why the candy was called ame no tori during the edo period. He uses a traditional Japanese scissors for snipping and paints on food colouring for the finished effect. 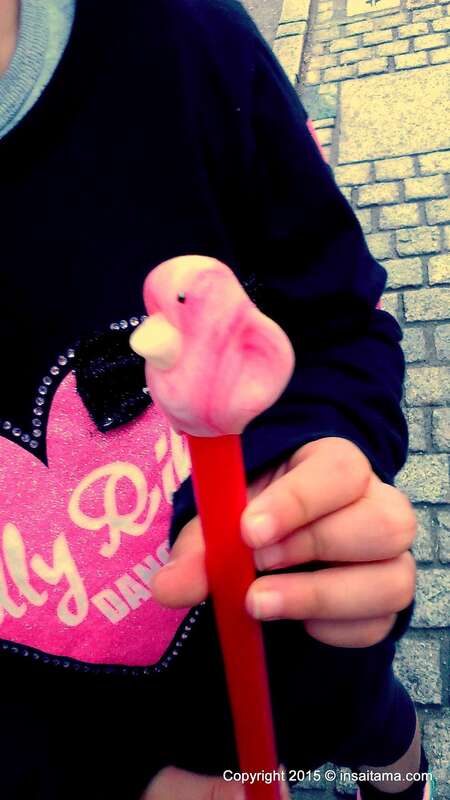 Pictured below is the ame no tori, candy bird, he made for my eldest daughter. There are other lesser known attractions in Kawagoe that you can enjoy on a one day visit to the area. For example, you can take a short tour of a shoyu factory close to the area that candy man Suzuki works. On the far side of the main tourist strip in the warehouse area, there is a really quirky shop where you can see Suzumebachi (Killer hornets) in jars and meet a magical dog. You will find even more off-the-beaten-track articles on this blog too. About 21 kilometres from Nerima to Kawagoe using the Kanetsu Expressway. The toll for the expressway is about 840 yen. About 40 kilometres from Hinode using the Ken-o highway. The toll is about 1400 yen.